The vector of colour lines. The ColourLines class defines the colour flow in a SubProcess. It defines a number of colour lines and specifies which particles are connected to them. Definition at line 23 of file ColourLines.h. A vector of colour lines. 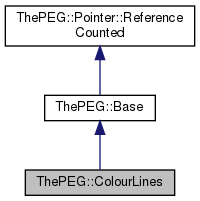 Definition at line 30 of file ColourLines.h. Definition at line 32 of file ColourLines.h. Definition at line 34 of file ColourLines.h. The string s should contain a comma-separated sequence of integers. Each sequence of numbers indicates a colour line and the integer represents a parton connected to it. If the integer is negative, it means that the line is the corresponding partons anti-colour. Note that the partons are numbered from 1: The first spacelike particle is 1, the second is 2 and the internal time-like and outgoing are numbered after all the spacelike particles. Create the corresponding ColourLines and connect the given partons. The partons are assumed to be in the same order as the numbers specified in the constructor. The string s should contain a comma-separated sequence of integers. Each sequence of numbers indicates a colour line and the integer represents a parton connected to it. If the integer is negative, it means that the line is the corresponding partons anti-colour. Note that the partons are numbered from 1: The first incoming is 1, the second is 2 and the internal and outgoing are numbered 3 and upwards.